Chris Dimino's waffle-making typewriter may be a few years old now, but that doesn't mean we shouldn't dust it off from time to time (Retromodo!) and encourage someone to help the man get it into geek kitchens the world over. 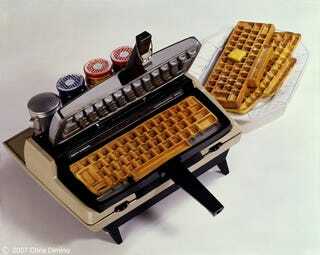 Dimino created the typewriter waffle maker for an exhibition called the "Next Best...Ding!" a few years ago. That exhibit, if you don't know by now, is all about reinventing the typewriter, which this reinvention does in spades. Dimino's version uses an actual Smith-Corona Coronamatic typewriter as its shell, and cooks up QWERTY keyboard-shaped goodness in about a minute.